Xi’s speech at a diplomatic summit reveals another piece of China’s security vision for Asia and the world. On Saturday, China hosted a ceremony to celebrate the 60th anniversary of the “Five Principles of Peaceful Coexistence.” Chinese President Xi Jinping took advantage of the opportunity to reiterate China’s vision for a new model of international relations — not just for Asia, but for the world. Xi originally outlined China’s new security concept at the May Conference on Interaction and Confidence Building Measures in Asia (CICA). During that speech, Xi emphasized two major points: the security structure in Asia should be universal, rather than benefiting “one [country] or a few countries.” As part of this, Xi condemned military alliances as an example of a security network that benefits a few and leaves many out in the cold. Second, Xi insisted upon a security framework where issues are “solved by Asians themselves” — a formulation that would exclude the U.S. from participation. Xi’s speech on Saturday hit on some of the same notes. “It is unacceptable to have security just for one country or some countries while leaving the rest insecure,” Xinhua quoted Xi as saying. Xi also emphasized a special role for Asia. He claimed there was something uniquely Asian about the “Five Principles,” as these principles embody the “traditional reverence for peace” shared by Asian people. But for the most part, Xi’s speech this time moved away from an emphasis on Asia alone. As opposed to his address at CICA, Xi was no longer outlining China’s vision for the Asia-Pacific, but instead was offering a new blueprint for global international relations. Xi’s speech hearkened back to an earlier era, when China saw itself as a champion for the entire developing world — in Asia as well as Africa and Latin America. As part of its communist rhetoric, Maoist-era China believed it had a duty to assist revolutionary struggles around the world. 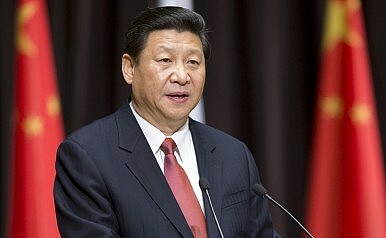 Xi framed history through this lens, describing the 1950s as the era of “anti-colonialism” when newly liberated countries in Asia, Africa, and Latin America “longed to establish equal international relations.” The “Five Principles” grew out of this era, offering a framework for relations between developing nations. While the rhetoric of communist revolution and anti-imperialism is gone, Xi made it clear that China still views itself as the champion of underrepresented nations around the world. “China will always be a reliable friend and loyal partner to developing nations,” Xi promised. The return to this emphasis on south-south relations puts a new spin on China’s security vision, which Xi framed as a new mode of international relations that accords more respect to developing nations. Xi noted existing problems of “injustice and inequality” in the current international system, problems he believes can be eliminated by embracing China’s “democratic” vision for international relations. “The idea of monopolizing international affairs in outdated,” Xi declared, saying that each country should have a say in determining the fate of the world. Xi also offered the “Five Principles” as a “thought weapon” that can be used to defend developing countries’ sovereignty and independence. Of course, while China takes every opportunity to emphasize its status as a still-developing power, many countries around the world already view China as a global power — and more of a threat than a protector to smaller regional states. Xi is once again trying to claim for China the role of an outsider, and the defender of other excluded countries, but this stance doesn’t fit as naturally as it did in the 1950s. It’s hard to believe that China, a permanent member of the UN Security Council, is somehow excluded from the current system of international relations. It’s also harder for China to portray itself as the defender of the developing world when its own actions are seen as increasingly belligerent. When Xi extols the “Five Principles” as preventing “the strong from eating the weak,” it’s likely to prompt eyes to roll rather than applause from countries like Vietnam and the Philippines, who believe that China itself uses strength to prey on the weak. That promise faces far more scrutiny today than it did in the 1950s. Threat, as it’s often defined, is composed of two pieces: intent and capabilities. In the 1950s, China claimed to lack the intent to become a hegemon — but more importantly, it lacked the capability. Now that China has the capability, it is proving much harder to convince its neighbors of China’s benign intentions. Xi’s throwback to the south-south cooperation of the 1950s ignores this crucial difference. To many around the world, China has already transitioned from a developing country to a global power, complete with hegemonic ambitions. The trappings of Maoist era south-south cooperation, with China as champion of the developing world, simply don’t fit anymore, no matter how Xi tries to repackage them. The Future of the Asia-Pacific Security Architecture, as Seen by ChinaReflecting on China's Five Principles, 60 Years LaterAt CICA, Xi Calls for New Regional Security ArchitectureXi, Karzai Discuss the Future of China-Afghanistan TiesWill Xi Jinping Visit North Korea This Year?